Michael Graham Salon and Spa, located in Naperville, Illinois, strives to offer the best salon and spa experience in the Chicagoland area. Michael Graham Salon and Spa was named the 2015 Salon of the year by Salon Today for their cool, clean and crisp decor punctuated with pops of color, which serve as the canvas for the artistry of hairdressing and puts the client on center stage. J Rudny was contracted by Michael Graham Salon and Spa to create a redesigned website that is fully responsive and includes a new content management system with a page manager. This project for Michael Graham consists of several major objectives to enhance their website, so the design reflects the brand of their two Naperville salons, which are stylish, clean and modern. Complete custom redesign of site. Responsive layout for mobile and tablet devices. Develop and integrate a new content management system (CMS) to allow staff the ability to maintain and grow content pages throughout the site. 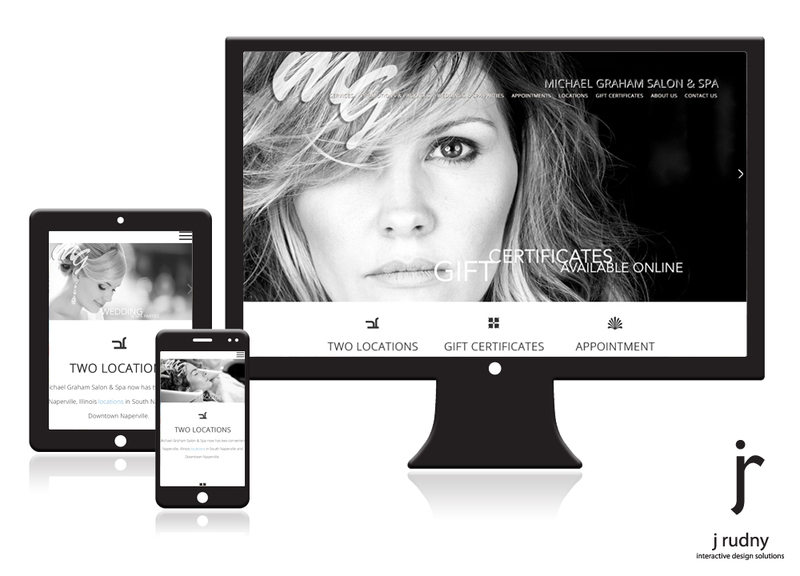 Our solution was to provide Michael Graham Salon and Spa with a website that had a redefined dramatic color scheme, that matched their branding at both Naperville locations, and was a responsive layout for mobile and tablet devices. Develop a new content management to allow staff the ability to add and edit content as needed. We also integrated an appointment scheduler for their patrons to easily make their next salon appointment. Fully responsive layout for desktop, tablet and mobile devices. Complete CMS for timely content updates. Training provided to the staff.